The successful biological control of banana skipper, which defoliates banana trees, in Papua New Guinea (PNG) saved Australia and PNG hundreds of millions of dollars in losses to bananas. Extensive skipper damage would also have threatened the local lifestyle as banana leaves are used extensively in day-to-day activities, from wrapping food to protection from rain. 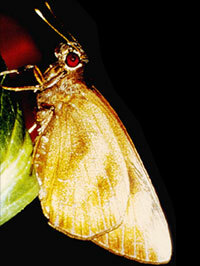 The butterfly arrived on the PNG mainland in 1983 and spread rapidly. There was concern that it would not only destroy PNG's banana industry but would also cross Torres Strait and blight Australian bananas as well. It was controlled using the small parasitic wasp, Cotesia erionotae. Evaluating the project, the Centre for International Economics calculated a benefit to cost ratio of 607:1 in PNG and Australia.